Discover the secret behind the elusive Sapphire Dragon! While piloting his Cessna in a Himalayan snowstorm, Raj crash-lands on a frozen mountain, thus kicking off the adventure in Jewel Quest 6: The Sapphire Dragon. Raj’s crash has led him to a chance discovery of the Temple of Wishes, an ancient complex thought to be only legend! Raj assembles a team to explore the temple, but plans change suddenly when the team encounters a gang of ruthless pirates! Raj’s hotshot team of archaeologists is led on a quest around the globe in pursuit of Jiang Hao and her pirate posse. On their journey, the group must use their skills to uncover secrets about the Sapphire Dragon. The threats to their lives are constant, yet romance is in the air as a love triangle forms between three of the friends. Discover whose heart will melt and whose will be broken as you become part of the team. Take on the treacherous sea and brave a raging volcano to catch your nemesis and solve the mystery. 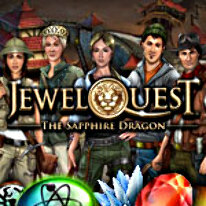 The journey will lead you through 200 brand new jewel boards as you unearth ancient wonders and discover the secret behind the elusive Sapphire Dragon in Jewel Quest 6. • Play 200 action-packed Jewel Boards, and challenge yourself with hidden bonus boards. • Travel from Nepal, to China and the Mediterranean to learn the secret behind the fabled Sapphire Dragon. • You asked for it! New Multi Matching Feature lets you swap jewels non-stop while others are moving. • Also by popular demand: Choose your own difficulty mode, from Relaxed to Advanced! • Choose from five adventurous characters to help you solve each jewel board. Each character has unique abilities that develop as you play! • Tackle new challenges in 8 never-before-seen jewel modes. Can you solve the board before it becomes flooded…or discover all-new jewel types?